Young people with long-term chronic pain are required to transition to adult services when they reach adulthood. 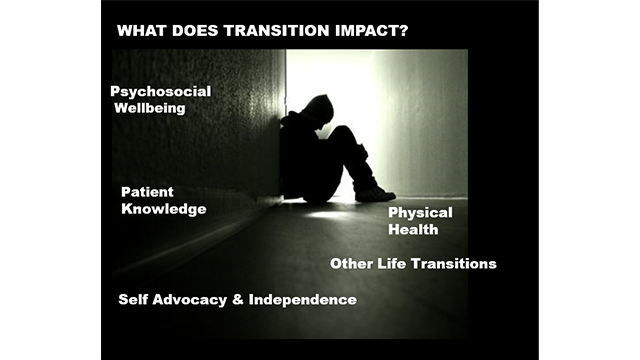 Transition should be a ‘purposeful and planned process of supporting young people’ (Department of health document 2012). Evidence suggests lack of support for patients at time of transition can lead to patients failing to engage in services and negatively impacts on both quality of life and health status (Singh 2009; Watson 2005). Patients considered to be most at risk of disruption and to fall into service gaps are those with enhanced risk of psychosocial problems and complex needs (Patten and Viner 2007, Crowley et al. 2011). Therefore younger persons with chronic pain are amongst those most at risk. Good examples of developed transition and resources exist for life limiting conditions such as diabetes, epilepsy or cystic fibrosis services (CQC 2014). Similar services for chronic pain are not well established and therefore there are clear gaps to support this group. Our aim is to meet this unmet need by producing an information booklet to support and signpost patients during this process. This will; provide accurate information about chronic pain, its psychosocial impact, reinforce self-management strategies and the support and treatments options available, enabling younger adults to play an active role in decisions about their health care. Focus groups were conducted for patients attending a younger adult’s pain management programme to understand and establish their considered needs. Literature review of existing transition literature and resources. The development of a first draft information booklet. Research options for design, illustration, editorial, printing and publication. Field testing the booklet with younger adult’s pre and post transition and charitable organisation Barnardo’s Young Carers service. Wider dissemination of the resource to improve and facilitate better and more informed access to appropriate services.